What Ethan Zohn did might surprise you. Before he became an instantly recognizable celebrity on the reality television program Survivor: Africa, Ethan Zohn played soccer professionally for teams in both the United States and Zimbabwe. So when he won the competition and found himself $1 million richer, he had to make some decisions. What would he do with the money and his new celebrity? It didn’t take long to decide. Ethan decided to use his money and notoriety to help spread HIV and AIDS prevention education to young people in Africa. It fit Ethan’s character. It was the perfect way to blend his value of serving others while paying tribute to Africa—a continent of people who had taught him a great deal. Using professional soccer players, Ethan’s non-profit, Grassroot Soccer, is educating an entire generation of young Africans. And, that probably would have been the end of a good story: young, attractive soccer player puts his money to work for others. For several years, Ethan devoted himself to his non-profit and existed as a television celebrity. But, then in 2009, another opportunity to serve came out of left-field: a rare form of Hodgkin’s Lymphoma. Suddenly the celebrity with the recognizable head of curly black hair was in the fight of his life. It’s a story of character your students will always remember. Ethan Zohn is a former professional soccer player, a star of reality television, an author, inventor, marathon runner, entrepreneur, humanitarian, cancer survivor, advocate and mentor, and a television host and inspirational speaker. Ethan’s career began as a professional soccer player in the U.S. and Zimbabwe, but that accomplishment seems almost a footnote now. From there he went on to win the acclaimed reality television show, Survivor: Africa. Using his winnings, he co-founded Grassroot Soccer (GRS), an international non-profit empowering Africa’s most influential role models—pro-soccer players and coaches—to educate youth about HIV/AIDS and inspire them to make healthy choices in life. As a Global spokesperson for GRS, Ethan is a driving force in the strategic vision, building strategic partnerships that have enabled GRS to offer lifesaving education to over 1.3 million young people in fifty countries. As captain of GRS Endurance Teams, Ethan launched GRS UNITED, a U.S. awareness campaign, by dribbling a soccer ball 550 miles from Boston to Washington, D.C. In 2011, after twice surviving a rare form of Hodgkin’s Lymphoma, Ethan wasted no time getting back to life when he ran the NYC Marathon. He is a passionate advocate for cancer survivors and cancer research and serves as a global ambassador for StandUp2Cancer, LIVESTRONG Foundation, Gabrielle’s Angel Foundation, First Descents, and many others. Ethan went on to host ABC’s Emmy-nominated show Everyday Health, and Outside Today for the Outside Television Network, and Earth Tripping, an eco-friendly travel adventure show in which he explored over 50 countries. 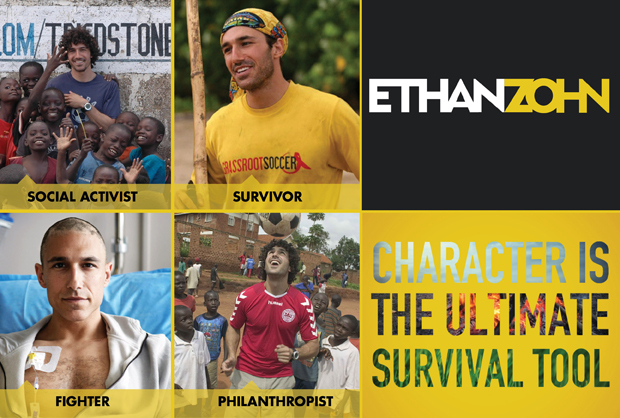 Ethan has returned to reality TV as a contestant on The Amazing Race, Survivor: All- Star, Fear Factor, Eco-Challenge and was featured in a documentary exploring the global AIDS pandemic entitled A Closer Walk alongside The Dalai Lama, Bono, and Kofi Annan. That’s what cured me! Eat as much as you can people ! In this keynote, Ethan begins with the question, “What would you do if you won a million dollars?” It’s a thought-provoking question that became a reality for the former professional soccer player and coach. After he had won $1-million on Survivor: Africa, Ethan followed his gut and invested his winnings in something much bigger than himself, a non-profit organization called Grassroot Soccer which promotes HIV and AIDS prevention education to Africa’s youth. It was a decision that perfectly matched his values and character: putting his good fortune to work for a cause greater than himself. That decision alone would make him a compelling speaker on character and service to others, and Ethan was settling into a life of quasi-celebrity and good works. Then in 2009, a less enticing opportunity gave him another chance to serve. In 2009, Ethan was diagnosed with a rare form of Hodgkins Lymphoma. Suddenly, he was fighting to become a “survivor” in a whole new sense. While he endured the rigors of cancer treatment, he became a national spokesperson for Katie Couric’s Stand Up to Cancer organization and kept a weekly video blog on People Magazine’s website. Millions watched Ethan fight the highs and lows of aggressive cancer treatment – his interest in service stronger than ever. A Survivor’s Guide to Life is Ethan’s chance to share his extraordinary journey with students looking for a way to make a difference in the world. For Ethan, life’s opportunities and challenges were faced with confidence by drawing on his values and character. In the keynote, Ethan delves deeply into the issue of character with his audience: where it comes from, why it matters and how it can help them make important decisions in their lives. Ethan relates the character-building moments in his life to illustrate how character is built and why it is important to develop, nurture and refine our character throughout our lives. “You never know when you will need the reserves of your character, but when you do, you better be sure you are up to the challenge,” he said. Character is difficult to define, but Ethan puts it into terms that students can relate to, and he sprinkles in personal stories from Survivor, battling cancer, and other experiences in his unique life. The values of honesty, integrity, friendship and honor—are as important in today’s society as ever. With his remarkable sense of humor and his honesty, he offers a keynote that inspires students to answer life’s opportunities with strength and conviction of character. how to ensure that all challenges, big and small, turn into opportunities that improve the lives of themselves and others. People love reality TV competitions because they can watch others react to the unknown. As the contestants are forced out of their comfort zone, will they embrace the experience to learn and grow from the challenges, or give in to the drama and fall apart? Strategy-based TV shows are similar to the incredibly complex world of college life. College is also a game of relationships that one must navigate every day – the relationship with yourself, your professors, your friends and teammates, your fraternity brothers or sorority sisters, and your family and friends back home. Add social media to the mix, and it can feel like your every move is publicly on display – becoming a struggle to get more “likes” and acceptance while also allowing yourself to be compared to and judged by others. Ethan had very different experiences on two shows, having won Survivor and been embarrassingly eliminated from The Amazing Race in the first few episodes. Over the last 12 years, his life has played out in TV, print, and social media. Ethan is also no stranger to overcoming challenges off-camera, having experienced the loss of his father at an early age and becoming a two-time cancer survivor. Under these pressures, he learned incredible lessons about forming relationships, building self-confidence, becoming a connected leader, and overcoming obstacles. In this keynote, Ethan shares his strategies for staying resilient in the face of life’s biggest challenges and creating positive relationships that will help students succeed in college and in life. how to create a lasting legacy on campus through authentic relationships, leading by example, and serving others.